I bought the bike brand new, original headlight still installed. Maybe in the UK they had bulbs, not here. Don't care what it shows. The US models were sealed beam. I wish they were not as I wanted to go LED myself but could not do it as it is a sealed beam unit. I didn't get that from a foreign web site. Find for me anywhere that shows a sealed beam headlight. Like I said earlier, pointless. That is Canadian and aftermarket. You really need to do a rectal cranial inversion. You win, no point telling a donkey not to run into traffic. Check other forums, you'll get the same answer I gave you. If you can't win the argument throw insults, works every time. Remove the three lamp mounting screws from the headlight case. pull the lamp assembly from the headlight case and remove the socket from the bulb. Unfasten the bulb retaining clip and remove the bulb. Reads like a a replacement bulb to me. My 76 is not sealed either. Just playing devils advocate here, but is it possible that different States used different lamps (ie California models had bulbs and others had sealed beam)? Not much help but in the UK we only had H4 bulbs. None of the (US) Honda online dealer web sites I use show a sealed beam. My 76 has a sealed beam, I put it in there. 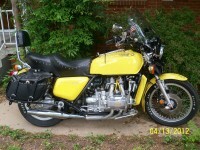 In the 1976 gl1000 parts manual located right here on this site it list 3 different lamps in use on the bikes. The bulbs in use are by Honda area codes. A is US,CM is Canada etc. Each area code has there range of frame and engine serial numbers.So maybe on the outside not enough sales in other country's and high sales in the US, some of those bikes came here instead. Only one out of the three lamps, has the removable bulb. Plus a list of serial numbers of carburetors and you can see if you have a 100% number matching bike. Area codes ED,F,G,K2-E have the removable bulb. The manual also shows flat rate times for different procedures on the bike such as engine removal. Interesting stuff.